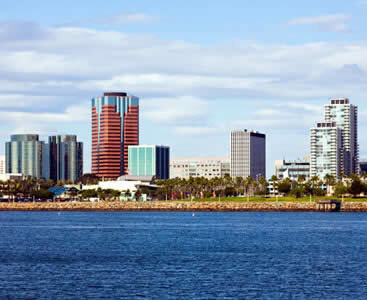 A city in Los Angeles County, Long Beach is an exciting city in Southern California. The city is found in Southern California and is situated on the United States Pacific Coast. The city boasts of one of the largest shipping ports of the world and its container port is the second busiest in the United States. It also supports a large oil industry complement to its oil wells found both offshore and underground. There are also quite a number of manufacturing companies in the city such as those that produce electronics, car parts and even audiovisual equipment. Long Beach Airport is a popular destination for those who are taking a cruise from the Long Beach Pier but it is home to many of its own magnificent attractions as well. This city is a great destination for both vacations and business trips. When arriving in Long Beach you need not worry about your airport ride. Prime Time Shuttle offers many transportation options that will take you all over the city. The “Blue Van” will pick you up from the airport or your hotel or any other destination of your choosing. You’ll be greeted by a courteous and professional driver who will take you to your destination. The airport is one of the most reliable options if you’re traveling to and from the Los Angeles County. It is a public airport which serves the locals as well as tourists coming from other parts of the world to enjoy their time here in Los Angeles. Long Beach is one of the finest places when it comes to tourist spots in the beautiful state of California. An important city on the western coastline reckoned mostly for its golden sand, blue water, and clear sky. The thing which makes LGB Airport so special is its small size. Due to this, the process here is quite quick making life easy for the travelers. Moreover, it is not very busy due to the presence of other airports in its close proximity. As a result, the lines move faster, security checks are quick and efficient, and staff is very friendly. The airport terminal is well furnished, providing beautiful views to the visitors. Moreover, there are numerous restaurants options within the close vicinity of the airport, allowing you to enjoy tasty snacks while you wait for your flight. The free Wi-Fi service at the terminal allows you to remain connected to your loved ones over your laptops and smartphones. So, if you’re traveling to the Long Island or any other place in the Los Angeles County, then this small yet beautiful airport should be your first choice for arrival. The LGB Airport is located along California’s beautiful Long Beach, one of the sunniest and most vibrant cities in the U.S. When you set foot onto California territory, the first thing you’ll want to do is have some fun, so you don’t want to waste any time. Be sure to get to your hotel quickly and safely by contacting us for shared ride van transportation, offering drop offs as well as pick ups to nearby hotels and other local landmarks. For big groups, be prepared to see big things. Gather everyone together and visit the famous floating hotel, RMS Queen Mary. With beautiful 1930’s art deco design and an on-site spa, you’ll never want to leave, but when you do be sure to get to your destination with ease and comfort by reserving a private van. While you’re out, visit Aquarium of the Pacific for astounding sea-life exhibits in a museum by the ocean. The Pike is an iconic amusement park founded in 1902, resting along the shoreline of Ocean Boulevard and a great place to spend an intimate evening. Take your special someone or meet that special someone by booking a private sedan with area providers by taking your car to The Pike for an unforgettable spin around the Ferris wheel. Visit other amazing spots like Rancho Los Alamitos, is an historic ranch home that offers intimate garden tours around the property, arriving without hassle in your comfortable sedan. There are plenty of roomy vehicles readily available with each one big enough to take a family anywhere, whether it be the serene Earl Burns Miller Japanese Garden, which is home to a quaint pond and waterfall, or El Dorado Park, a fun public space that offers sunset views on lakes, fishing, and plenty of trails that venture deep into Long Beach’s vast ecosystem. Be sure to get your vehicle early so you can see all that Long Beach has to offer. Long Beach is home to plenty of celebrity households, film festivals, and big-name visitors, making the high-class eatery scene to die for. Be sure to show up in L’Opera Italian Restaurant in unmatched style by reserving your very own stretched limousine. Ask your chauffeur where the best place to get cocktails is, or take our word for it and visit The Sky Room, an elevated lounge that offers tasty eats and city views. Reserve some of your time and visit the interesting historic harbor, Port of Long Beach for beautiful seaside views. If you’re looking for something less intimate and more group-friendly, take the bus to Naples, a massive area of canals, walkways, and beaches spread out across several miles, spending the day going on walks and shopping and unique boutiques. The climate of Long Beach is the Mediterranean Climate. The city however depicts some rather strong semi-arid climate features. Just like most of the other Southern California destinations, Long Beach mostly experience sunny days. This characteristic makes Long Beach a destination that is worth visiting, especially during the summer. For nature lovers, there is quite a lot to be enjoyed in this city. The city still hosts a couple of native plants of the area. Some of the native plants available here include the California buckwheat, California poppy, California sagebrush. The El Dorado Nature center also has got a number of coast live oak. 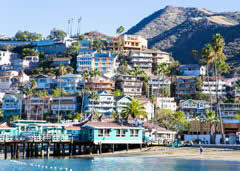 Popularly known as Catalina Island or just as Catalina, Catalina Island is found off the Californian coast along the Gulf of Santa Catalina. The island itself is an incredible sight that offers a great view especially to those who visit on a sightseeing tour. To get to the island, you need to take an exotic cruise trip from California. The stunning but rocky Catalina Island lies over twenty miles to the South West of LA. On arriving at this perfect hideaway destination you can relax all you want and take fun in all that you love to do. Besides exploring the Avalon ocean front shops, you can also try out the delectable local island cuisine. You can also take a trip to the large interior of the island and enjoy a fantastic view of the buffalo as well as the dramatic vistas of the coastline. Catalina Island is also endowed with a number of hidden harbors and inlets. The Catalina Island Chamber Of Commerce & Visitor Bureau is another exciting place to visit during your visit of this region. 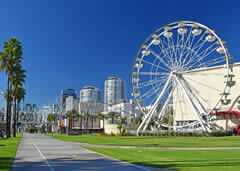 Established in the year 1902, The Pike was an amusement zone situated in Long Beach. The Pike offers a classy tourist destination due to the fact that it is home to food stands, various independent arcades, a grand bathhouse and a number of gift shops. Some of the popular attractions in the Pike include the Lido Ballroom which was initially a livery that was converted to a skating rink and then into a dance hall. Tattoo parlors are another common attraction in the Pike. There is also the Band Shell which is a Municipal Band of Long Beach. While in the pike, you can take pleasure in the Pike’s popular amusements like the ocean center, amusement arcade and shooting galleries among other great sights.